This is the first of a two part posting on habitual leadership. Part one will address the neurological basis for habit formation and the consequences of habits both positive and negative. We will illustrate these concepts through a real case (identities have been altered to safeguard client confidentiality). In part two (next posting) I will share ways to isolate and modify dysfunctional habits. In the center of our brains close to where it meets the spinal column are the parts that have evolved over millions of years and that control much of what is known as the “auto behaviors.” These include functions that are critical to our survival as species such as breathing and swallowing. Over time more complicated routines such as cooking a meal have been made into habits that require very little effort. Extensive research chronicled in “The Power of Habit: Why We Do What We Do in Life and Business” written by Charles Duhigg 1, shows that our brain is on a constant mission to use its energy in the most efficient manner possible. In other words, it is looking for ways to economize and if possible to convert as many of the decisions into routine habits as possible. This opens up space for the brain to address less familiar and more complicated computations and decision making. The danger of course is that if our brain switches channels pre-maturely, we ignore important information and/or critical nuances prior to turning on our auto response behaviors. We develop “blind spots” that prevent us from making the correct calls. It turns out that our brain looks for ways to select amongst the cues and see which can be categorized as habits. 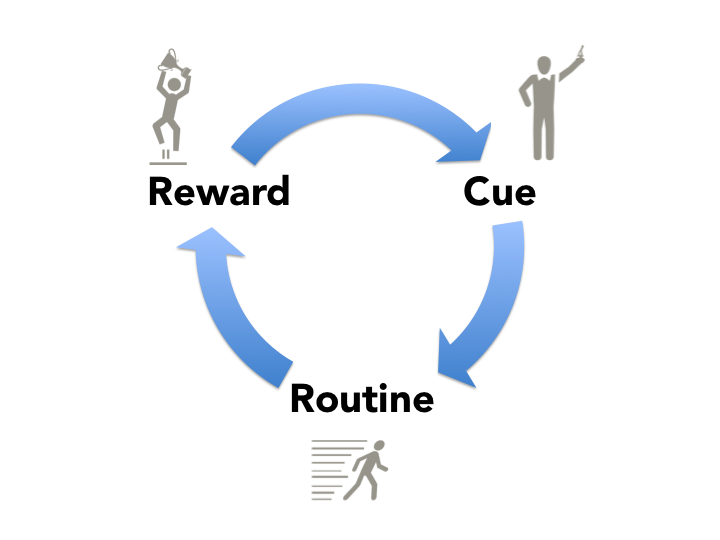 The way that it selects cues has a lot to do with which routines have been rewarded. Furthermore, the routines that are most established and hardest to change are those where the associated reward actually satisfies a “craving”. For example, the sight of chocolate, chocolate craving and eating chocolate to satisfy the craving. Leaders too have developed habits and often display reflexive behaviors. These behaviors are typically learned and practiced over their career and to the extent that they are rewarded they become part of the formula associated with their success. Sam had been attracted to drug formulation because he found the science of discovering new molecules and formulary fascinating and fulfilling. Throughout his academic career he has been recognized as one of the most creative and ingenious scientists. Sam had perfected a routine for his work and research. He had come to understand what areas would attract the most interest from his peers and broader scientific community, how to write proposals and seek grants, develop an extensive and well recognized cadre of collaborators and knowledge network. He also knew how to position his projects and himself for the right venues and audiences. Throughout his academic career various pharmaceutical companies had been courting Sam to join their R&D organization and had dangled impressive titles and compensation. However, he remained indifferent to these offers. His freedom of thought and unrestricted collaboration with his network of thought leaders were more important to him than financial rewards. By the time we started our work together Sam was at a very different place. A global pharmaceutical organization had convinced him that they were in the midst of a transformational culture change that would make their organization look and feel like a more nimble bio tech. He was promised in no uncertain terms that he could continue to conduct his research in the same manner with unrestricted access to his network. He was promised significantly larger budget and unlimited access to the intellectual property of the organization. He was also promised to lead the culture change initiative and told that his background and external perspectives make him the ideal candidate for the role. After numerous courting sessions including several with the CEO and global head of R&D Sam relented and joined the pharmaceutical organization. It was not long before Sam started to notice that what had made him successful in the academic setting was not going to be rewarded. For example whereas in the past he had been attentive to signals from the scientific community and focused his research accordingly, his new organization placed more importance on the perspectives of the business development and commercial organizations to determine where research resources should be directed. In his new environment open ended Socratic dialogue, which was his preferred approach to innovative thinking, was not respected as much. His colleagues seemed always to be in a hurry, shuttling from one meeting to next. They seemed to be anxious about having conversations and discourse that did not result in defined deliverables or next steps or that were not somehow connected to a cascaded set of goals that were supposed to connect and align the activities across all levels in the R&D organization. He was given feedback about his communication style. He was told that he did not carry executive presence and in fact he came across as too academic (a definite negative in this new setting). His request to release his budget and resources came under scrutiny. His supervisors wanted him to present the “business case” for these expenditures and were not impressed by his instincts and experience (for which he was hired in the first place). They told him that they simply could not expend resources based on hunches or discovery projects that were not backed up by the collective wisdoms of their pharmaeconomic and value proposition groups. And that these expenditures needed to be “on strategy” and have to be in areas that aligned with the portfolio prioritization process that the organization had put in place for allocating resources to projects. Prior to attending industry and academic knowledge sharing forums he had to secure approval from his supervisors and his presentations were now thoroughly reviewed by corporate lawyers and intellectual property experts to ensure that he did not divulge proprietary information. His former academic colleagues started to feel the difference in how Sam interacted with them and became more reticent in sharing their views and perspectives with him as freely. Duhigg, Charles. The Power of Habit. 1st ed. Louisville: Random House, 2012. What leadership habits have you formed over the years that are no longer serving you? How are/have your habit been rewarded? How would you coach Sam at this point? I am usually shocked when I call a business and get a scratchy voicemail message, a pc voice telling me that the wireless caller I am attempting to attain is out of their calling area, or a fax tone screaming in my ear. When this happens, my first impression of that company, right or incorrect, is that they are unprofessional, a fly by evening operation, not set up, and I am frankly not comfortable performing company with them. Use a get virtual sms number Method. These systems were designed to assist small companies stay connected and audio much more professional. You can choose in between a nearby or toll free number, and enjoy features like limitless extensions, call forwarding, on hold songs, title listing, and more. Calls can be forwarded to any number so you can be reached on your house, office, or cellular. I use a service called Grasshopper and I have it established up so I get an e-mail whenever I have a new message. To link numerous computer systems with each other and to the Internet, you can use a wireless router. The router connects to the Internet, and then a network cable from every of the computers connects to the routers. This allows the computer systems to all share the same Web link, and accessibility other servers that you may select to make accessible. The Wizard of Oz is a fantastic example of what not to do to develop your company. By avoiding some of Oz’s important mistakes, you can creative a customer service technique that will benefit your business. Either way, it’s good to finally have accessibility to my library on a cellular device that doesn’t require an internet link. It negates the require for carrying hefty Bibles to small team. With the digital contacting playing cards buying and contacting is so simple.a couple of actions on a Computer and you are carried out. Speak for lengthy.it doesn’t price the earth any longer.